Maybe your little one refuses to try new things; they will eat a restricted range of preferred foods. However, their restricted diet and refusal of anything different is making you crazy. You may have even tried forcing one bite or rewards for trying and nothing has worked! There is a different way! It’s important to acknowledge that food refusal is normal. Children (especially toddlers) will go through phases where they will be more selective about what they eat. First off, this is largely dependent on their temperament. For example: A child who is more laid back and more of a people pleaser may be easier to feed and can be easily coerced or rewarded to eat. However if you have a child that is more strong willed and independent, those same techniques may not work for them without causing huge battles. Second, understanding your child’s development is important too. Starting at 7 months and continuing to 3 years old, your child is in the separation individualization stage of development. This means they are learning to be their own self, separate from you. As it relates to feeding, they will thrive when they have structure with autonomy around their eating. In other words, they will say no to a food they normally eat just because they want to show you they can make their own decisions. It’s how they master this phase of development. 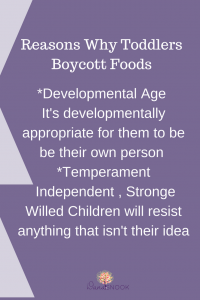 (Spoiler alert: If they make it through this phase of development without having to fight for control around food, the next stage of development they actually will try to please you!). However, if you get so caught up in food battles they may not out grow it. Sometimes parents will think this could help. If they don’t eat what they are served, they don’t get anything else. The thought process may be trying to teach them that they are not going to get something they like to eat if they don’t eat. Remember, it’s about control. Children will even refuse to eat the food they don’t want to get the food they do like. This technique will also interfere with your child learning to have a good relationship with all foods. They will learn that the food they are trying to get me to eat must be SO BAD that I get to eat this food if I eat it. It will also put the “good” tasting food on a pedestal as superior to the lesser food. 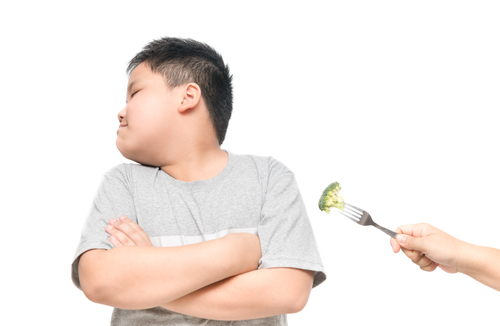 It’s not uncommon to hear parents trying to sneak in food their child won’t eat. Mixing the first with the vegetable or even making desserts with a vegetable base. Your children are smart – they will know! The biggest reason I don’t recommend this technique is because you WANT your children to learn to like these foods. 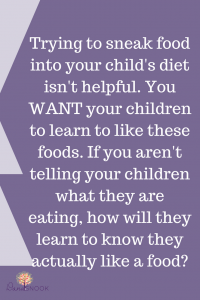 If you aren’t telling your children what they are eating, how will they learn to know they actually like a food. Now I’m not against making zucchini muffins or putting spinach in a smoothie, but I really do think it’s important to tell your children what they are eating. It really does come down to raising your children to have a trusting relationship with food – they can’t trust you or the food if you are sneaking it. Instead of trying to control their eating – take a different approach and trust them to learn to sneak up and eat these foods again! Remember, they are trying to exhibit control. This means the harder you push the more they will push back to “make their own decisions.” If you don’t think you are pressuring, make sure you read this blog post because pressure easily sneaks in in ways you don’t realize. One of the worst things you can do is to get so fed up you stop serving them. Children come and go with foods. They might eat lots of a food, get sick of it, and give it up for a little while, but that doesn’t mean they won’t come back around to it again. It’s VERY normal for kids to go through food jags and you can read more about it in this blog post. Teaching your children to be good eaters means not focusing on what they eat from day to day, but looking at their overall relationship with food. If you are doing things to “get” them to eat more or less- or- any of your techniques are causing food battles, this won’t help in them in the long run. This is why serving a variety of food is essential at each meal – it allows them to pick and choose and do best with eating. I offer this free resource on what to serve if you have no idea. As a general rule of thumb, if it’s causing stress at the table it’s probably not doing anyone any good.